Historians and art historians have been aware of the importance of the memorial list of Bruges picture makers for a long time. Both in the 19th and 20th centuries, the text had been published already. At the great Memling exhibition in 1994 the document was put on display for the last time. Hans Memling’s mention in the memorial list is obviously an indication of his – in literature usually disputed – membership of the picture makers’ and saddlers’ trade. 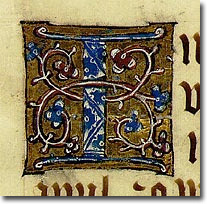 Also Pierre Coustain, the 15th century Burgundian court painter, was registered in the memorial list of Bruges picture makers and saddlers, which means that he, despite his status as a court painter, was a trade member as well. The memorial list of the Bruges picture makers’ and saddlers’ trade is an archival, i.e. official document. It was conceived as a record within the picture makers’ and saddlers’ trade. The memorial list served for one of the activities within the trade, which is the commemoration of all deceased members during an official service. We also want to emphasise here that the memorial list originates from the trade itself and not from a possible ecclesiastical or religious guild within the trade. There are two indications of the fact that we are really dealing with a document of the trade archives: first of all, it always carefully registered which subdivision of the trade the deceased had belonged to (painters, saddlers, canvas painters, saddlebow makers, harness makers, stained-glass artists and mirror makers); subsequently, some members are indicated asdeacons: it always concerns the deacons of the trade. So, after the prayers for the deceased, the register contains the names of all free masters of the trade who died as members of the trade between 1450 and 1801, in principle in the order in which they died. The year of death was not mentioned until the beginning of the 17th century. Before that, the year of death was sometimes added by another hand. For instance, in Gerard David’s case, on p. 27, the (erroneous) year of death 1524 was added. In actual fact, Gerard David died in 1523. The frequent subsequent additions in the register must therefore be considered in a critical way. Occasionally, the order of dying may slightly differ from the order of registering as well. Yet the register contains a number of major objective data: the name of the deceased together with his profession are proof of his membership at the time he died; every registered name also produces evidence of one person’s existence, which may be important to distinguish between various people bearing the same name; and obviously, the (non) occurrence of a name is an indication of his death in Bruges. All things considered the register contains data about 354 painters, 88 saddlers, four saddlebow makers, 120 canvas painters, 194 stained-glass artists, 85 harness makers, 26 mirror makers, four gold foil illuminators, two incunable printers and a dozen others (especially priests-chaplains). It is remarkable that the term “picture makers” (painters) does not appear in the memorial list. It is common knowledge that the Bruges painters were not exclusively “picture makers” by profession, they also were, in most of the cases, simple artisans. 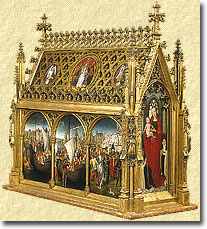 Hans Memling, among other things painter of the world famous Ursula shrine of Saint John’s Hospital (presently: the Memling Museum) was registered in the memorial list: “Meester Jan van Menninghen”” scilder”, clearly indicating his trade membership when he passed away in 1494.